The tiny screech owl looked out from a cavity in a cracked, hollow cottonwood tree near Yakima. It was amazing how cryptic the bird was. I wouldn’t have noticed it if I had not been looking up, admiring the gnarly stem of that big old tree. That cottonwood, with broken branches and a rotten core was a great example of a “Wildlife Tree”. 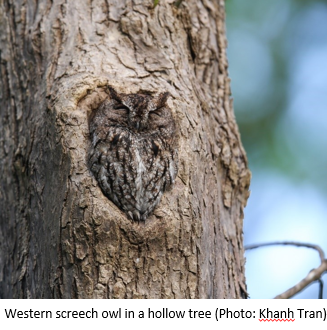 Wildlife Trees can refer to those with some sort of “defect” allowing animals to get inside and use the central portions of tree stems as secure habitat for nesting, roosting, or denning. These are crucial habitat for about 40% of our forest species in Washington. The solid woody cylinder that makes up a tree bole is usually unavailable as habitat for the numerous species that utilize cavities. These critters include small mammals such as bats, insects such as wasps and bees, numerous birds including owls and the iconic wood duck, and larger mammals like raccoons or black bears who can den in hollow trees. These cavities only exist when certain conditions occur. First, a tree has to grow large enough to provide the woody mass needed for a cavity large enough for the species. Then, something must happen to subsequently hollow it out and create the space within the wood. Random events, such as weather related broken tops, followed by heart rot infestation, or pre-existing heart rot in a main stem (say, for example, in a large cedar) followed by a branch breaking off, (then more rot and insects) could create these cavities. However, these events are generally rare in the forest and are less likely in managed forest settings, as we tend to remove dead and “defective” trees from our stands. And then there are woodpeckers. These keystone species create cavities as a regular part of nesting and courtship behavior, carving perfect and appropriate hollows in rotten stems to meet their needs. They leave some cavities behind as they make new ones each year to meet their biological imperative. They need standing dead wood that has been dead long enough to get soft enough for the woodpeckers to dig it. These types of standing dead trees can be rare but hold great habitat value. Humans can make cavities too, using arborist techniques of climbing and creative chainsaw work to hollow out stems for wildlife to use. I had a recent opportunity to visit past Wildlife Tree work and inspect the outcomes after 12 years. 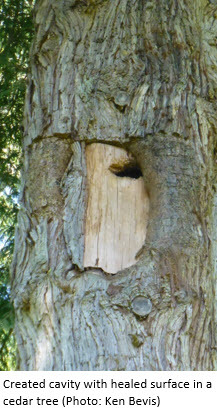 In 2006, wildlife tree creation pioneer and expert, Tim Brown of Snoqualmie, WA, worked with the U.S. Army, U.S. Forest Service Research Lab, and the Nature Conservancy on Fort Lewis (near Olympia, WA) to create cavities. This work had the goal of providing habitat for nesting wood ducks, Western gray squirrels, pollinators and other wildlife. Earlier this summer, (June 2018), we returned to look at these cavities to assess what sort of use had occurred. Tim climbed up to some of these old cavities and looked inside. What we found was fascinating: Nesting material was present in every single cavity examined, along with eggshells, indicating successful hatching of wood ducks. One had a failed clutch of 3 wood duck eggs (we examined them and determined they had been in the cavity for a long time and were dead). Others had evidence of mammal use (squirrel) and yet another had a colony of honeybees. All inspected cavities were intact and functioning. Creating the cavities is relatively straight forward, but highly skilled tree climbing and chainsaw work is necessary. A shallow section of the tree, perpendicular to the up-down axis, (a face plate – see photo) is cut on the tree surface, removed and lowered carefully to the ground. 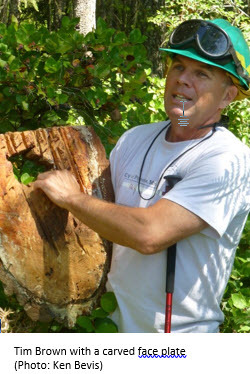 Then, a saw is used to hollow out an appropriate sized cavity in the tree (approximately 12” x 12” x 18”) mimicking a pileated woodpecker cavity. An opening is cut into the faceplate of about 3” or 4” in diameter, at an appropriate height from cavity bottom. Then, this cavity cover is returned to the hole and attached with nails or screws. Simple, and it works as we observed on Fort Lewis. What sort of wildlife were you hoping to attract? What sort of trees are best for cavities? How long have you been doing this sort of work? You can call Tim at (206) 271-2020 to talk about his copyrighted work. The substantial value of these wildlife trees as habitat cannot be overstated. Practitioners now make habitat trees all across North America, and many of these techniques originated and were refined in the Pacific Northwest by Tim Brown. If you have questions or stories about creating or protecting wildlife trees on your own forest property, please send some pictures and stories to: ken.bevis@dnr.wa.gov Thanks! And keep on protecting wildlife trees! Fisher. Photo. John Jacobsen/Wash. Dept. of Fish and Wildlife. Predators. The word conjures up visions of fierce cougars or grizzly bears sneaking around in the dark looking for human-sized prey animals. But what about the more diminutive predators, such as fishers, that eat small mammals, fish and birds? Fishers are members of the family Mustelidae, which also includes weasels, marten, mink, otter, wolverine and several other predators. These are a remarkable assemblage of similarly built critters: short legs, sharp eyes and teeth, highly sensitive noses and explosive speed and agility. They are adept at catching many different prey species, from shrews, mice and birds to fish and, in the case of wolverines, deer. They also a diverse lot with many different lifestyles that can include climbing trees, skittering through forest undergrowth, cruising high mountain snow fields, burrowing underground or rapidly swimming after prey. Fishers are a unique forest-dwelling mustelid. They are a medium-sized weasel, about the size of a house cat. They are a rich chocolate-dark brown in color and reside in low- to mid-elevation forest habitats. With a body length of about 36” include tail, and weighing between 8 and 10 pounds, fishers are slightly larger than marten, which tend to live at higher elevations. Fishers disappeared from Washington forests decades ago due to overharvesting for their fur, habitat destruction and their vulnerability to trapping (weasels are suckers for a good scent lure). After wildlife surveys in the 1990s and early 2000s detected no fishers in Washington, a state recovery plan identified the need to reintroduce these animals to the state. In 2008, the Washington Department of Fish and Wildlife (WDFW), US Geologic Survey, Conservation Northwest, British Columbia Ministry of Environment and National Park Service combined efforts to organize a fisher reintroduction release in Olympic National Park. Another set of releases in the South Cascades began in the fall of 2015. All of the released animals were relocated from British Columbia in cooperation with the BC Trappers Association. In 2017, reproduction was documented near Mount Rainier National Park. It is shaping up to be a remarkable success story! 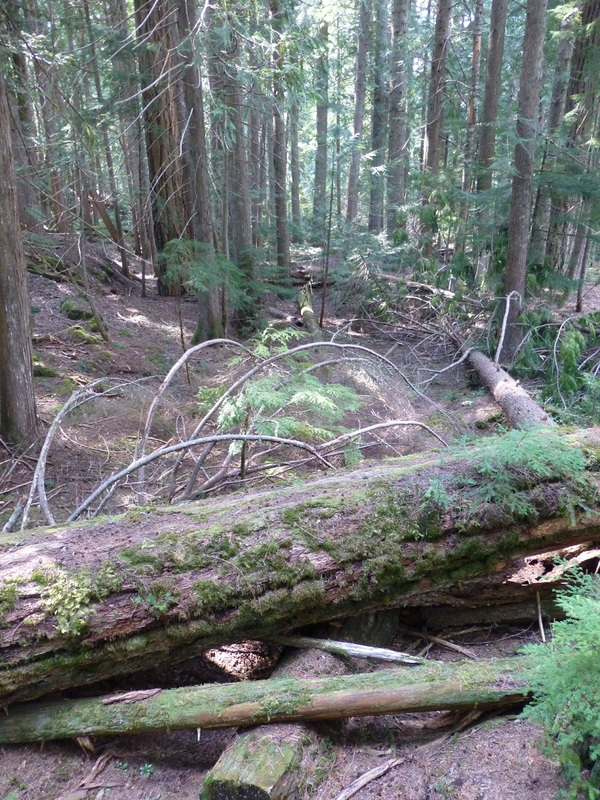 Fishers need forested habitats with a rich understory, snags and down logs to support the small mammal populations they prey upon. Fortunately, managed woodlands can provide all of these habitat features. 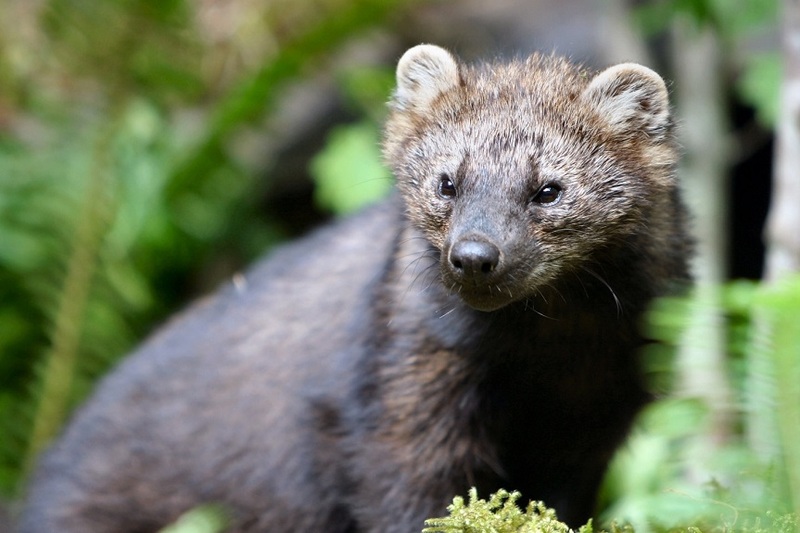 It is hoped that successful reintroduction of the fisher to Washington state will result in sustainable populations across the landscape. Because managed forests are capable of providing suitable fisher habitat, small forest landowners on the west slopes of the Cascades have a direct interest in learning about the habitat needs of this amazing animal. To encourage landowners to take part in assisting the success of this species, the US Fish and Wildlife Service, in cooperation with WDFW, offers a program in which landowners agree to protect fishers on their lands. In return, the landowner receives protection from any future land use restrictions that could result from the presence of fishers. This arrangement, a Candidate Conservation Agreement with Assurance (CCAA), is straightforward and many landowners, large and small, have already signed on. Click here for more information on the CCAA program. Fishers are no threat to normal workings of family forest lands (unless you happen to be a mouse, squirrel or chicken!) and they can provide a natural control over damaging rodents in tree farms. Returning this animal to our ecosystem will restore some of the remarkable richness of Washington’s forests. For more information on the fisher and CCAAs, please visit the WDFW website, or contact Gary Bell at (360) 902-2412. And as always, feel free to contact me with your questions, stories or photos of wildlife on your forested woodland. Downed logs provide shelter to many forest species, including the rough-skinned newt, which sometimes overwinters in old logs. Photo: Ken Bevis/DNR. The forest floor is rich with life, largely unseen, largely small. 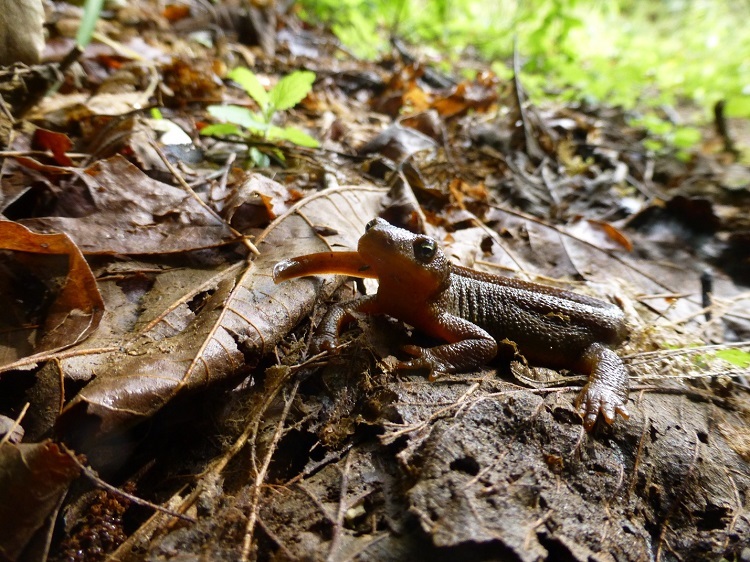 Salamanders and small mammals creep and crawl about in the great struggle for survival that is nature. While battling with red teeth and claws, they need quiet places to rest, reproduce, feed and regroup. All of this drama quietly unfolds beneath our very feet, and downed logs play an integral role. These creatures live beneath and within the rich decayed material that is derived from our forests. Wood and leaves break down mostly through fungus, enhanced by the actions of insects, amphibians, reptiles and small mammals that chew wood, and move spores about. Dead trees that have fallen over and become down logs offer some of the richest habitats in this universe of decay. Many amphibians and small mammals make use of cavities in down wood for important life history phases. For example, many salamanders breed and feed in decayed wood and use spaces in rotting logs for critical cover. Red-backed voles and deer mice use interstitial spaces in dead logs and snags for cover and places to look for food. Douglas squirrels cache cones in down logs and use cavities large enough for them to enter. Pine marten and snowshoe hares covet large cavities in, and cover under, down logs. 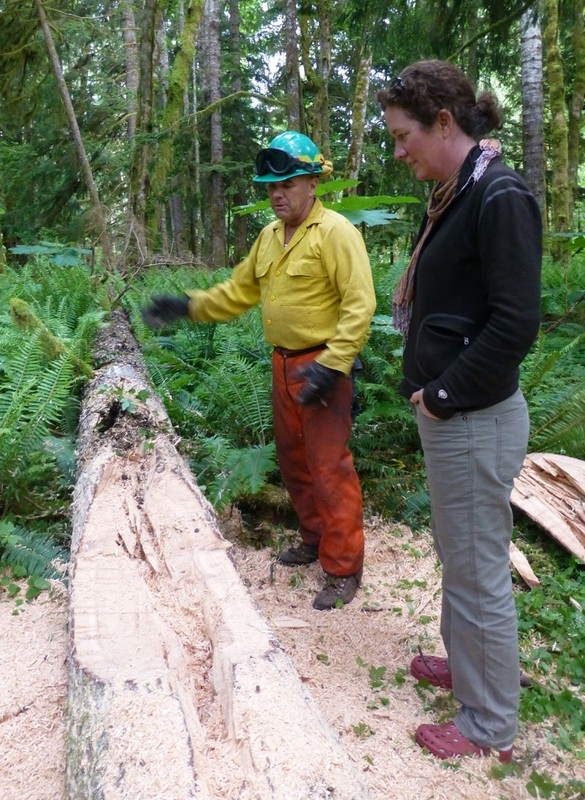 Tim Brown shows Tara Chestnut, a landowner, how he is turning a recently downed log into a home for wildlife. Photo: Ken Bevis/DNR. Yet, the down log can be a solid eminence for many years, and these animals sometimes have to wait for time to open up the logs to allow their entrance. Breaks, cracks and holes created by physical damage, animals or the action of fungus can take a long time to appear, or might never exist at all, before the log crumbles away into soil. Can we help? Of course! Targeted management action can enhance this process and provide immediate habitat for these small, unheralded but essential organisms. The normal tools of forestry applied in the cause of habitat creation will suffice; in other words, a chainsaw and a thoughtful operator. Tim Brown has been creating wildlife habitats out of trees for over 42 years. He got his start as a logger and firefighter, and progressed to become a nationally recognized leader in wildlife tree habitat techniques*. Tim recently spent a day with me in western Washington and we created a habitat log on a small forest landowner’s property near Mt. Rainier. We located a recently toppled hemlock behind the home of Tara Chestnut, a local landowner, and with her permission we “worked it up” using Tim’s chainsaw and expertise. I asked Tim some questions as the work progressed. What wildlife species will benefit from this work? Lots. Including: salamanders, mollusks (snails and slugs), beetles and other arthropods, ants, spiders and many small mammals such as mice or voles. What ecological process are you trying to imitate or encourage? What species and type of log works the best? What about slope position or landscape location? “Since many of these creatures we are targeting like moist places, the closer to the riparian areas the better.” Lying across, rather than down, a slope is preferred, as the uphill portion of the log will collect soil and moisture. How do you make a habitat log? Tim used his saw to cut into the log at various angles and provide entrances and cavities within the log for the use of small wildlife. He used his saw like a knife, plunging into the log at various angles. He prefers a 24-inch or larger blade for this kind of carving work. Left: Tim Brown cuts a slab from a hemlock log. Center: Duff and vegetation are placed into chambers and slits carved into the log. Right: The finished product. Note the entrance on top. Similar slits on the lower edges allow for an alternate entrance. Tim explained that the middle of the log was accessed by taking a big slab out of the top, about one-third of the way through, in an arc pattern. This works well, as it is a single cut, and then it sits back on top without having to fasten it on. Water will infiltrate and collect in the log along the cracks created by the cuts. Sometimes, people will nail the slab on. If you use steel nails make sure the log will never be cut up for wood; a heavy rock placed on top could do the trick. After the slab is removed, slits and chambers are created in the center of the log. Chambers inside of the log are accessed by the slits that go all the way through, some out the bottom and side of the log. For small mammals, try to make the slits slightly wider by pushing the saw through three times or more. Remove as much sawdust as possible so passages are not clogged. For amphibians and mollusks, Tim adds soil and some organic material to give a jump-start to decay. He thinks small mammals prefer dry habitat, so try to keep the chambers clear for them; they will bring in nesting material. Tim has gone back and monitored logs like this one he has created over the years, and reports plentiful wildlife use of these created log habitats, including small rodents, marten and salamanders. He has even hollowed out larger logs to create bear dens. (Subject of a future article). Down logs benefit many forest wildlife species, and provide opportunity for the small forest landowner to enhance habitats. Be creative. Use your saw to hollow out solid logs and help the little critters use them more, and sooner, in the decay process. Let us know what you try, and send some pictures of your project! There’s life in dead wood. Contact us for more information or training on Tim’s wildlife tree techniques.